An ex-Gurkha, who gave up a lucrative job as a security guard in England, is devoting his post-retirement life to the development of his native village of Shikha-4 in the district. 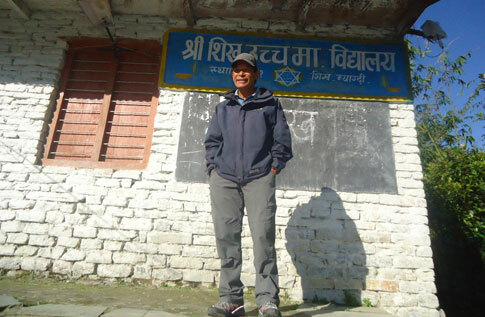 Bagbir Paija, 61, since returning home has already helped Shikha Secondary School become a higher secondary school. He has spent around Rs 1.5 million of his earnings and helped transform the school destroyed by a fire eight years ago into a modern facility generating around Rs 30 million. His day as chairman of the school management committee starts at five in the morning with cleaning the 10 toilets at the school. He stays back at the school during the night to make sure that the sorry tale of the past is not repeated. Though Paija returned to Nepal after hearing about the arson at the school, all other members of his family still live in England. He eats his meals at a local hotel. “He has brought about massive changes in the school forsaking a lucrative job in England,” Principal Jagadish Acharya was effusive in Paija´s praise. He had joined the British Army in 1968 and worked as a security guard in England since his retirement in 1985. He returns to England once a year to meet his family and spends rest of the time working for the development of the village. Paija, who is also chairman of the local health post, has been active in construction of roads and electrification projects as well.